The Wednesday ATC run was a little spooky this week—runners ran 4- and 6-mile loops en masse and in costume on the Town Lake trail, and HOKA ONE ONE and 2XU were on hand for demos and costume judging. Costumes ranged from Snow White to dragons to an unidentifiable green thing. ATC Racing’s Marla Briley, president of dog-rescue organization GSP Rescue, arrived as Cruella Devil with the slightly spotty Nikita by her side. Patrick Healy made a convincing Aquaman, and the Skinner family represented the Land of Oz: little Adelyn a pint-sized Dorothy, Leah a scarecrow, and Gray a creative “tornado,” bravely running with a conical plant cage wrapped in toilet paper and dry leaves over his neck. Some costumes were so creative that we’re not even sure what they were, and other runners simply came as themselves. Tim Dove’s annual 21st birthday was also part of the celebration. 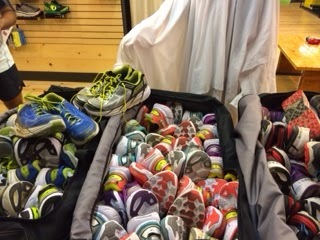 Running in HOKAs may be uber comfortable, but running in costume is not! When planning your “spirited” run wardrobe, several important matters should be taken into consideration for overall safety and comfort: Visibility! Because it’s important to be able to see when moving rapidly in a forward direction wearing a sheet over your head. Heat levels! Because Big Foots and other furry monsters aren’t always happy and healthy when it’s 80 degrees. And, last but not least...Durability! You want whatever you put on to stay on, especially if it was minimal to begin with. Happy Halloween from everyone at ATC! Join the Wednesday Run: The group leaves from ATC Barton Springs every week at 6 p.m. Anyone is welcome for the run and/or beers at the shop after. 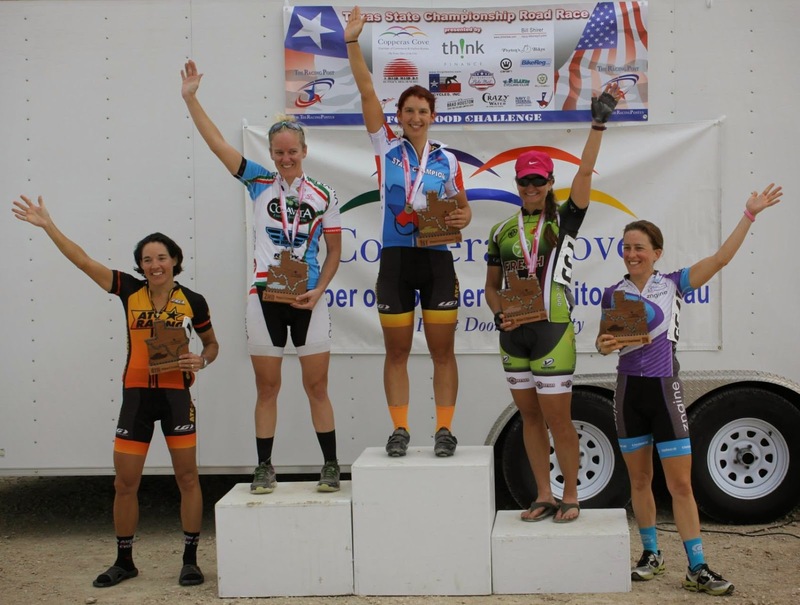 Follow Austin Tri-Cyclist on Facebook to get the latest info on other fun events, demos and more. Both of us are on speakerphone, and I pause a beat, thinking maybe I’ve misheard, but no, Freddie’s just got a sense of humor. And maybe a fair bit of confidence. 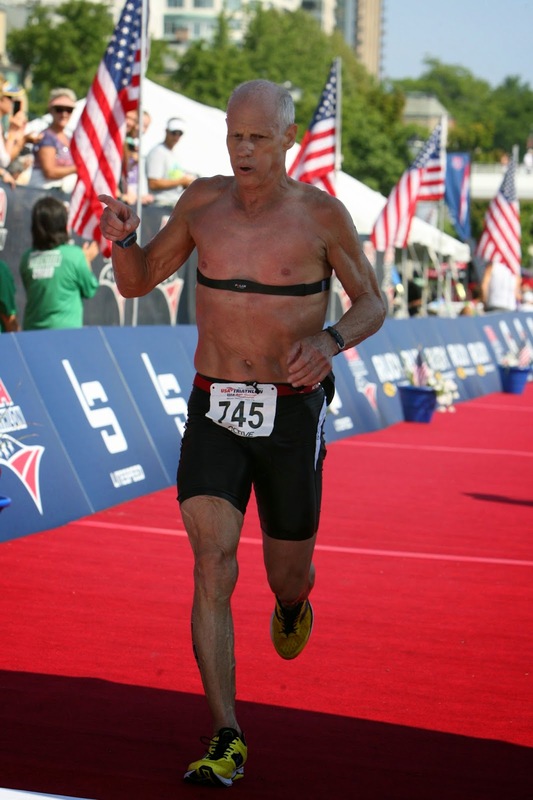 On August 9, Freddie won the USAT 64-69 age group Olympic distance national championship in Milwaukee with a time of 2:16:57. Previous years at nationals he’d placed second, fifth, eighth, and ninth, but had never crossed the line first; this win, the culmination of years of hard work, came on the heels of many frustrations and disappointments. Freddie suffers from Atrial Fibrillation (often referred to as AF or AFib), an irregular heartbeat that can lead to other complications, including stroke and heart failure. The condition is fairly common among veteran male endurance athletes, and some studies point to a causal link. Freddie has been involved in athletic competition for most of his life. 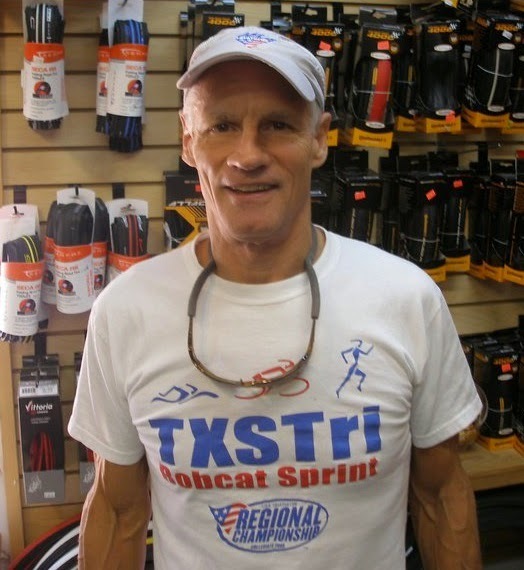 He swam on a scholarship at the University of Texas in Arlington, and in 1985, he won a national championship in Hobie Catamaran racing. Over the years he also qualified for nationals in swimming and judo. In all the sports he competed in, however, Freddie says triathlon was where he showed the most natural talent. In 2002, at 52 years old, he fell headlong into the sport, focusing on sprint and Olympic distances. He quickly hired a coach; for the last nine years, he’s worked with cogniTRI’s Stephan Schwarze. In 2005, Freddie had his first experience with AFib at the world championships in Hawaii, but he thought he might just be feeling the effects of dehydration. When it happened again at nationals the following year, he went to the doctor and found out about his heart condition. The irony is, of course, that the habits of the life-long athlete—which likely led to the condition in the first place—don’t die any easier when the diagnosis is made. Freddie continued racing, though he says in recent years he starting going by “Not-So-Fast Freddie.” The condition and prescribed medications significantly hampered his ability to compete. In 2007, he had an ablation, a type of surgery that destroys or isolates the structures responsible for triggering abnormal electrical signals in the heart. Unfortunately, as is common with this type of procedure, the arrhythmia reoccurred about a year and a half later, and he was back to square one. Afterward, he raced for two more years taking pills designed to keep his heart from going into AFib, but knew they were affecting his performance. He also felt that his heart was being pulled dangerously in two different directions during race efforts—the pills slowing it down while his body was trying to push it to its limits. In September 2013, he had a second ablation, and this time the treatment worked. On the same course and under roughly the same conditions, he was able to finish five minutes faster at nationals in 2014 than he had the previous year when he was still taking the pills. Often the venue for nationals changes each year, but 2015 will be the third year in a row that Milwaukee will host the event. Freddie says of all the nationals he’s been to over the past 11 years, this is his favorite venue. Though the swim often becomes congested as competitors pass beneath a narrow bridge, the hilly bike course suits him, and Freddie says the city “rolls out the red carpet” for race participants. He plans to return to nationals again next year. One more time, he says. Last year was supposed to be the finale, but his good result at nationals was tempered with an equally bad experience at the August 27 world championships in Edmonton, Canada. He came out of the water first in the swim, but then his body locked up in the cold temperatures, which hovered somewhere between 41 and 45 degrees. Cold and miserable, he didn’t finish the race. He decided he couldn’t go out on that note. A common descriptor used for athletes—triathletes in particular—is “intense.” I used to worry when meeting someone for the first time who had been described in this way. I would imagine a recovering drug addict with the shakes, or one of those perpetually angry people who can’t drive a quarter mile without a road rage incident. When used for a triathlete, however, “intense” seems to describe a unique and admirable brand of overboard, a characteristic that’s essentially a prerequisite if an athlete plans to pursue the sport at an elite level. To be successful, you have to obsess about aero details and training plans; your day and your workouts must be fanatically regimented. For Freddie, triathlon has long been a full-time job. What’s interesting about Freddie, maybe even a little refreshing, is that he doesn’t wax on about how wonderful the sport is. I think anyone who takes any type of activity to the highest possible level, whether it’s cake-making or multisport training, and can still love it day in and day out...well, good on them, but my guess is that they’re not pursuing it to the degree they could be, or they’re just plain crazy. I don’t know Freddie well, but I’m not sure I believe him. It’s true that at a certain point there’s more labor than love in competition, but when you devote years to a sport, it’s impossible to separate yourself from it without a little nostalgia. It’s a part of who you were, and in many ways, who you always will be. Of course, with Freddie, the first question is whether he’ll even stop competing. If I was one of those lovely Florida ladies in contention, I think I’d jump the gun and meet him at the finish line in Milwaukee. A common topic of debate is how much faster modern triathletes are today thanks to fancier bike equipment. Some claim that legends like Mark Allen and Dave Scott rode their round tube frames just as fast as today's pros ride their high-tech carbon, aero equipment. Comparing bike performance is a tricky business, as a host of factors make bike times very "noisy." The winds at Kona vary greatly, which can affect bike times by as much as 15 minutes or more. Tactics also affect times, as some years the contenders will all be together on the bike course with nobody pushing the pace. To try to answer the question and make sense of it all we have put together some interactive charts. The slowtwitch kona archive provides a handy source of data on the top 10 finishers each year since the start of Kona. We chose to look at the time period from 1988 to 2014, as this represents a period when the depth of talent was solid and the course was relatively constant. It also represents a time after the introduction of the aerobar, when professionals were already adopting bike positions similar to modern athletes. Some small course changes have occurred over these years, but the bulk of the bike course has remained the same. Before 1998, bike times used to include transition times. They generally add up to about 4 minutes, so we have subtracted 4 minutes from all bike times prior to 1998. First up, we take a look at the average bike splits among the top 10 overall finishers. Hover over a year for more info, pictures, and links when available. You can see that there is a clear downward trend in bike times. 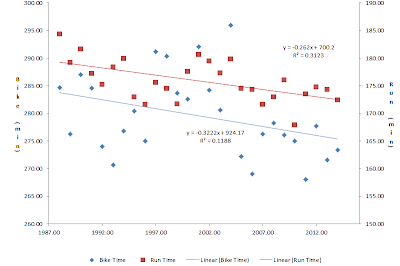 The linear trend shown in light blue suggests that bike times have improved by about 8.3 minutes over the time period. However, that isn't necessarily all a result of improved bike gear. Records have been dropping in all sports, even those like running, in which equipment plays almost no role. Since running isn't impacted much by technical advancement, it gives us a great point of comparison. We can compare the trends in the Kona run and bike and see if one has been improving at a faster rate than the other. We find that running times have improved by about 3.7% since 1988. If athletes were making 3.7% more power on the bike course, we would only expect about 4 minutes faster bike times, not 8. This suggests that bike gear could be responsible for about 4 minutes of time savings, which is in line with what we might expect given the drag improvements in gear since then. Another interesting thing to note is that there has not been any improvement in the top 10 average bike splits since 2006. This is not entirely surprising as the degree to which bike gear has improved since that time is not huge, and not every athlete has access to the very best gear. Another way to slice the data is to look at the fastest bike split each year. In this case we took the fastest bike split each year among the top 10 finishers. Anyone setting a fast time and then blowing up on the run is thus excluded. Hover over a point below to see who set the fast time that year. 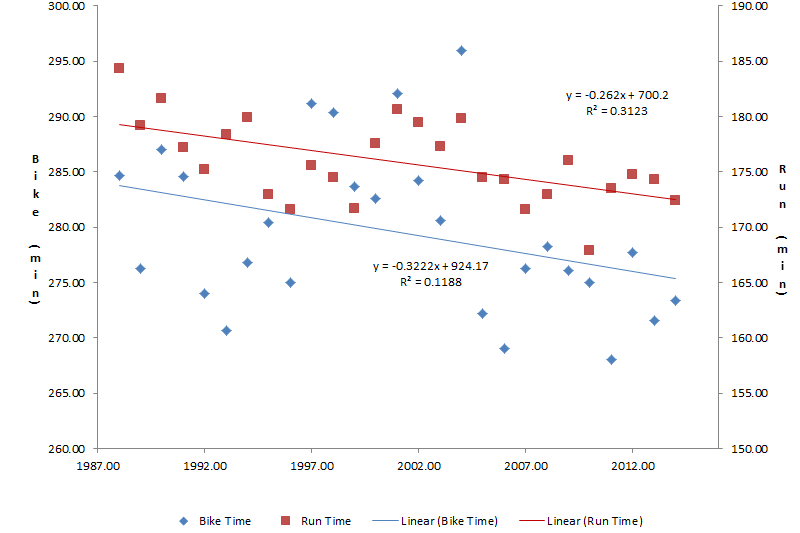 Again we see a clear downward trend in bike times, almost the same trend as in the top 10 analysis in fact. One interesting property of both the top bike splits and the average bike splits is the consistently slow times between 1997 and 2005. Wind, tactics, drugs, and talent are possible explanations that come to mind, but we really don't know. If you have any ideas, drop us a comment and let us know. Also interesting is that unlike the top 10 bike splits, the best bike split is still trending down since 2006, perhaps reflecting that the top cyclists in the sport are taking more care to get the best performing sponsors and setting up their bikes as slick as possible. 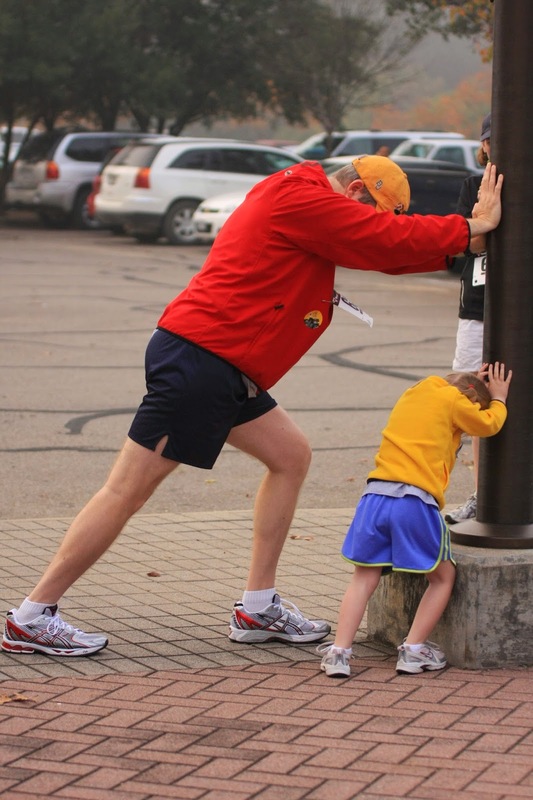 As a parent, sometimes competing in endurance sport is an exercise in guilt as well as physical stamina. While guilt is perhaps an innate characteristic of modern-day parenting—you’re worried about everything from whether her carrots are organic (not that she’ll eat them anyway) to what effect putting her in timeout is going to have on her future SAT scores—but being an athlete adds another half a dozen layers to an already very complicated task. You don’t want to bore your kids, or deny them their own recreational activities, or hear them complain, 20 years from now, that their typical childhood weekend consisted of getting up before dawn to stand on the side of the road in the rain and wave for two seconds as mom or dad trotted by. If there’s one thing you learn from being around kids, though, it’s the value of compromise. And not necessarily one of those eat-your-broccoli-and-you-can-have-ice-cream kind of compromises. It’s more like sharing. What if you were to plan out your race schedule or training in a way that ensured the whole family got to do something they consider fun? The HEB Zoo Stampede 5K/10K run on Saturday, Nov. 8, which starts at the Cameron Park Zoo in Waco, makes for a fun and easy weekend getaway for all ages. Strollers are okay (pets are a no), and chip timing is available for an extra $5. Awards are given to the top three male and female finishers in each age group, as well as the top overall male and female finisher. Chidren under 12 must be accompanied by an adult. Keep your race bib to enter the zoo and participate in the day’s special programming, which includes special talks from keepers and enrichment activities for the animals. One of the animal activities is painting, and many of the pieces are for sale—if you ever dreamed of owning the work of a Sumatran tiger or an African elephant, this is your chance. The 52-acre zoo, located along the Brazos River, is special because it boasts a completely natural habitat for its 1,700+ animals, which represent more than 300 species. 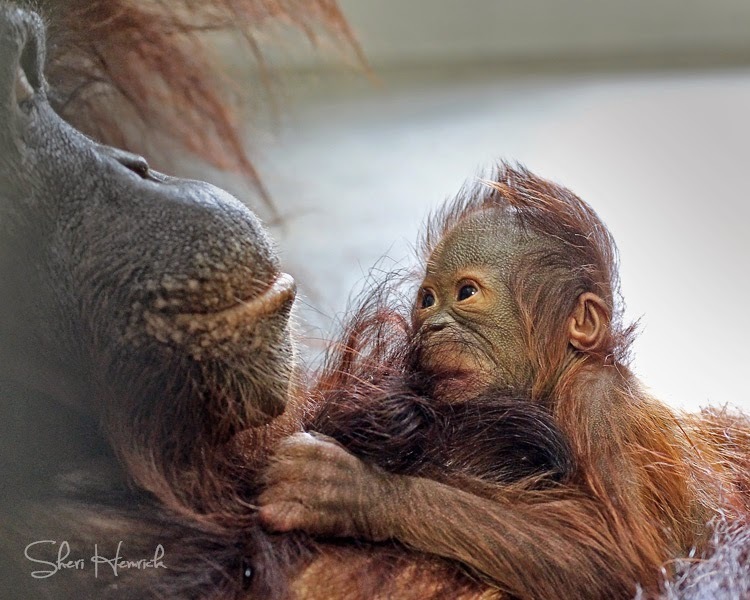 Three highlights will steal the show with a young audience: baby orangutan Batari, who is now about five months old; a new giraffe-feeding platform; and a clear acrylic tube that allows young visitors to slide through the underwater world of the river otter habitat. While you’re in town, don’t miss the Mayborn Museum on the Baylor campus. Many of the museum’s exhibits on the natural science and cultural history of Central Texas are hands-on and kid-friendly. 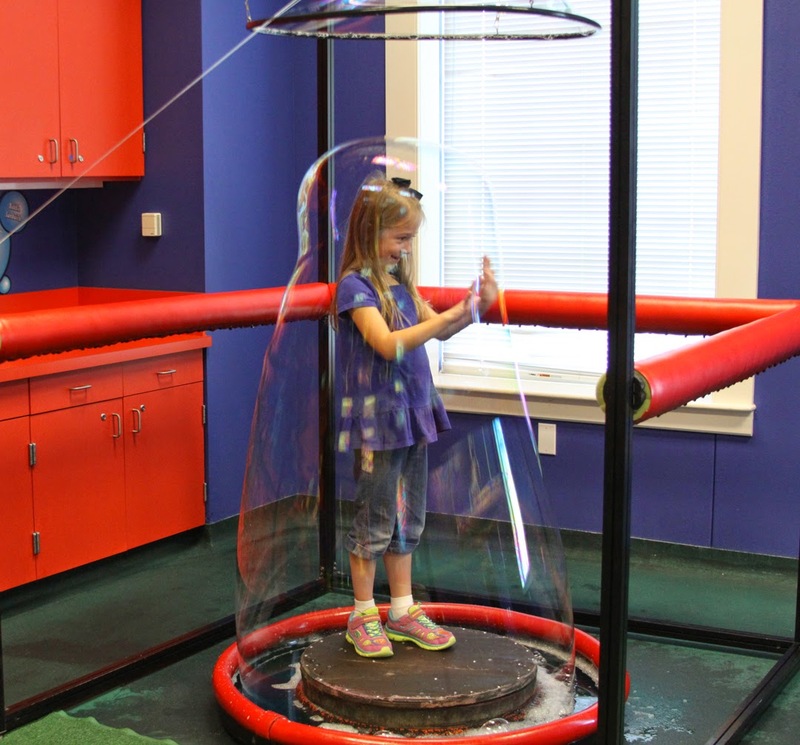 A favorite is the water and bubble room, where kids can blow giant-sized bubbles and even step inside one. “Aunt Blanche’s tea room” is the place to go for imaginary refreshment, and the pioneer room, where kids can sit in a wagon, don period-style clothing, and try out pioneer tools like washboards or looms, is a good way to show how good they have it with their own household chores. This Texas Highways article describes the museum’s offerings in depth. 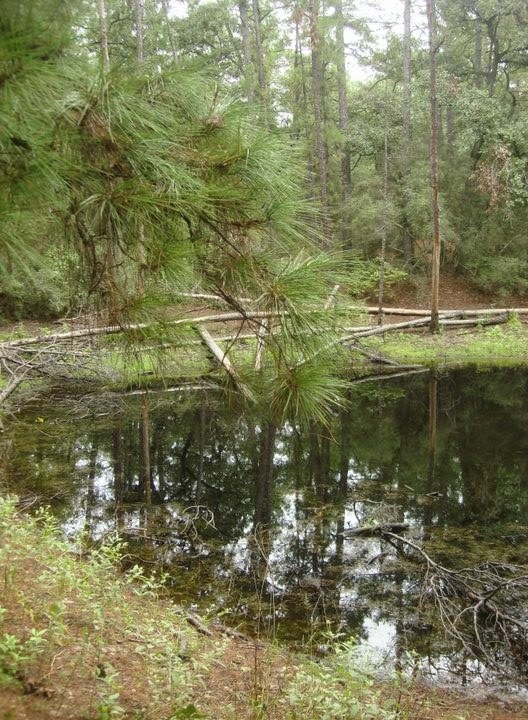 Though wildfires destroyed much of Bastrop State Park’s pine forest in 2011, the 1930s-era CCC cabins were saved by firefighters, and many trails, campsites and facilities have now reopened. Park Road 1C to neighboring Buescher State Park offers about 12 paved miles of rolling hills and solitude. Since it has very little traffic, the road is both a good place to train and to bring older children or beginners to ride. Pedernales State Park is one of the often-overlooked gems of the Texas park system. If you like clear, moving water and a little geology, this is one of the nicest places you can spend a weekend in the Hill Country. Accessed by a short nature trail, the falls area—formed by a tilted bed of layered limestone that causes the river to drop about 50 feet over a distance of 3,000 feet—is the main attraction. Water levels change this landscape dramatically, creating deep pools and rock islands. Swimming and wading aren’t allowed at the falls, but you'll find ample entertainment in exploring the steep slopes and rushing water, navigating around obstacles, fishing the banks, and searching for Cretaceous marine fossils embedded in the rock. Swimming is allowed further downriver, where the Pedernales looks more like a typical Hill Country stream—much more shallow, crystal clear, and lined by beautiful old cypress trees. The seven-mile Wolf Mountain Trail would make a good trail run, and the park road is a good place to bike or run on pavement. 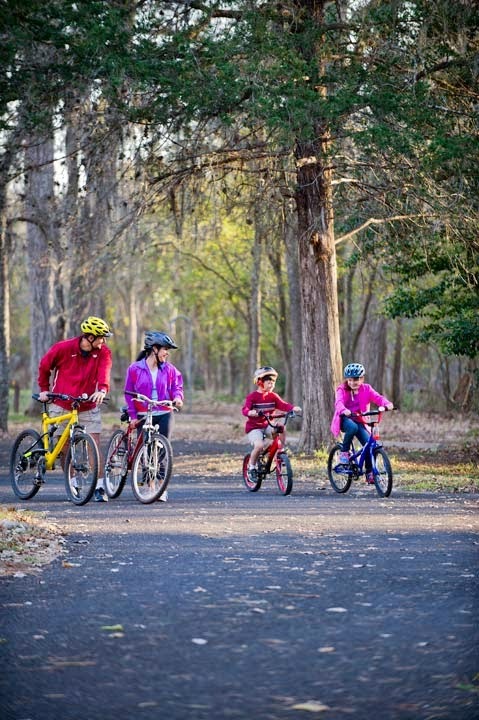 You can also head east from the entrance of the park onto Fitzhugh Road, a popular cycling route. This particular stretch of Fitzhugh, from the park to Highway 12, is the nicest to ride as it has the least traffic. Erock is so popular that you have to plan your visit carefully. Once the park reaches capacity, you have to wait outside the park until other visitors leave; on weekends and holidays, there’s often a long line of cars idling outside the gate. 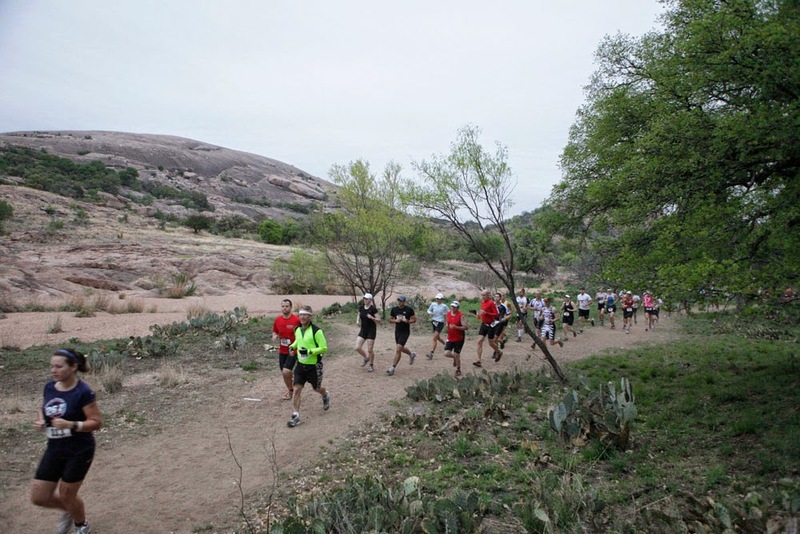 The five-mile Loop Trail is a great run; this trail is the first run segment of the Enchanted Rock Extreme Duathlon, held in March. (The last run is straight up the Summit Trail to the top.) Cycling in the Fredericksburg area is very scenic, and it’s easy to get a lot of miles in. October 16 is the final Driveway Series for 2015. If you haven’t seen this friendly, fast-paced Thursday-night criterium in East Austin, you’re missing out. Free beer and bike racing—need we say more? Spectate or race the events for the adults, which start at 5 p.m., but let the kids show you how it’s really done in the final race of the night, the Kids’ Lap at 7:11 p.m. Most participants are 5 or 6 years old, with an average age range from 3 to 8 years. This video by Wienot Films features the stars of the show. Can’t make it next week? Check back in the spring for the 2016 schedule. Cyclocross can be intimidating—sticks and stones will break your bones, but man, the heckling really stings, too. We hear that the fans are a little nicer to kids, though. The Dirt Derby kicks off with a kids’ race every Thursday night through November 25. Kids under 18 are free! How cool is it to race on the same track as F1 cars? HITS Austin, held on December 14 at the Circuit of the Americas racetrack, has “a distance for everyone,” offering a Friends & Family mile, 5K, 10K, half marathon, marathon, and sprint duathlon (2 mi run/10 mi bike/2 mi run). We’re looking for more ideas and tried-and-true methods for balancing family life and competition in endurance sport, especially local events and destinations. 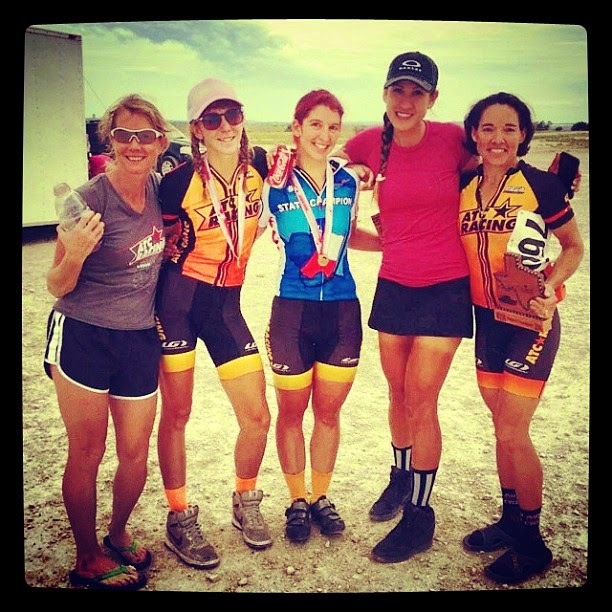 Share your stories with us on the Austin Tri-Cyclist Facebook page or send an email to kat@kathrynhunter.net. Most of my non-cyclist friends and family don’t realize that cycling is a team sport. Typically, they ask if the course was timed, as though it were about personal bests. Strategic terms like “attacking,” “counter-attacking,” and “bridging” are lost on them. 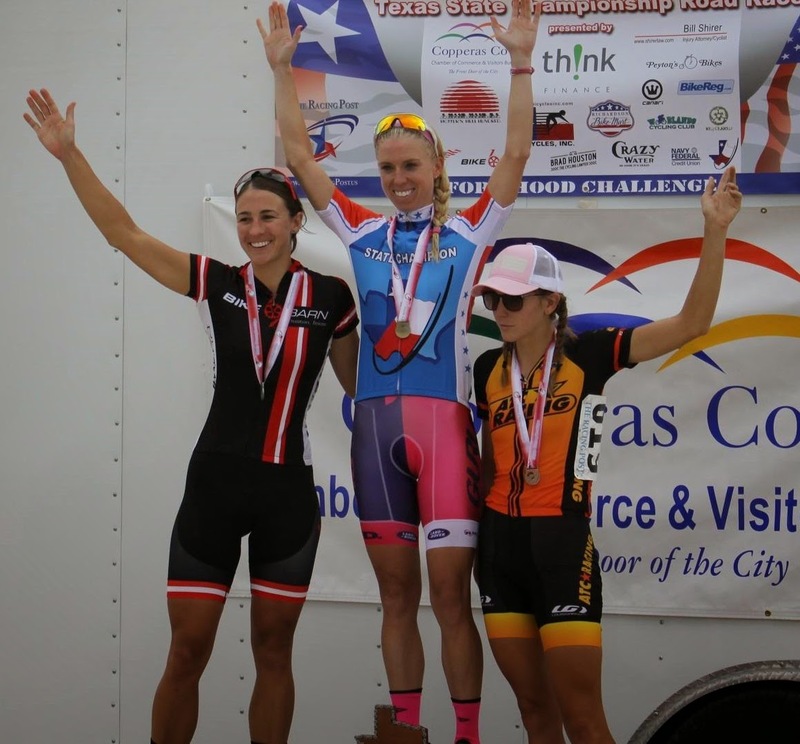 However, if there was one race that could illustrate just what teamwork can do in cycling, it’s this year’s cat 3 state championship road race in Fort Hood. When we toed the line at 1:10 that afternoon, ATC had four ladies ready to work. Also lined up were Alexis Hamilton (Colavita) and Kelly Barrientes (Think Finance), both of whom are phenomenal racers and who we knew would be our major competition. Alexis and Kelly both have outstanding sprints— so as a team, our plan was to make sure that the race didn’t boil down to a pack sprint. We had to make it hard early and make the other girls chase us for 66 miles in hopes of creating a break. We went through the first three miles of downhill a bit antsy. I noticed one girl was having trouble clipping in and was swerving a bit, and told my teammate Lori to be wary and pass the word along. Shortly afterwards, around four miles in, Marla threw out a massive attack. It was perfect! Kelly took the bait and went with her, and quickly they became a small speck up the road. We expected the other girls to start chasing (clearly, we weren’t going to go after Marla), but the pack was confused and unwilling to work together. As the miles went on and the gap increased to over two minutes, a few possible scenarios surfaced. We could let Marla and Kelly go and let them duke it out at the finish. We could continue to bait Colavita and hope that they would get nervous about the gap before we did and start to chase. Or, we could attack the remaining peloton to form another break. Missy, Lori, and I chose the final option. If we could bridge up to Marla without the rest of the field, we’d have all four of us on the podium. I attacked with 10 miles to go to the feed zone on the first lap and got away for around six miles (thinking “HELP!! !” and hoping that I’d eventually see Marla and Kelly ahead). Lori tried to block Alexis in, but Alexis and Lacy Thomas (FRESH Racing) worked to chase me down about three miles from the feed zone. Lucky for me, Missy had caught on to them without the rest of the peloton. Our little group pedaled steadily through the feed zone, polite as ever. Our other team members were supporting us with expert bottle handups (thanks Kat, Jack, Kent, Robert!). Soon after, we caught up to Kelly and Marla, who looked pretty cooked. Marla was cramping, and I believe Kelly was too; they soon fell off of the break. Marla had worked to wear Kelly out for an entire 33-mile lap by herself. Everything looked good at this point—we had a four-person break, with two ATC riders and minus one of our main rivals. Missy and I managed to talk and decided that she would work on the front to keep the pace up until the final, massive hill 12 miles from the finish, where I’d try to start wearing the others down with repeated attacks. Missy continued working hard, and we rolled through the hilly course at a fast clip until 12 miles to go. Alexis started leading cautiously up the giant KOM hill, with Missy, Lacy, and I following. About halfway up, I swung wide and gave it everything to gap the other girls. I got lucky, and no one was on my wheel. The rest of the race was simple—hold on and hammer for dear life. I’ve never been so happy and proud to cross a finish line. Our plan had worked perfectly! We communicated clearly, and each of us used our individual talents to contribute to an incredible result. Missy took fourth, time trialing in, with Alexis second and Lacy third. Races like these make me sad that the season is over, but it bodes well for an exciting season in 2015! (C) Austin Tri-Cyclist 2014. Powered by Blogger.